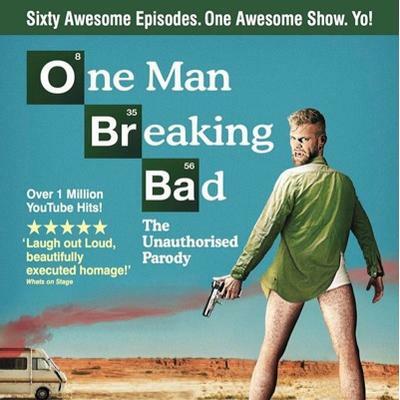 It takes a brave soul to tackle all five seasons of smash-hit TV series Breaking Bad within a single action-packed evening. But that’s the tough task LA actor Miles Allen has set himself. One Man Breaking Bad is set to take Cardiff by storm when St David’s Hall is transformed into Albuquerque, New Mexico for one night only on Wednesday 4 March. And after this super-charged show you’ll definitely remember his name! Join Miles on a rip-roaring ride through the greatest television show ever made as he channels Walt, Jesse, Saul, Skyler and all your other favourite characters through one body. His incredible impressions have led to over a million hits on YouTube, and sell-out runs at festivals in Melbourne and Edinburgh. At last year’s Fringe all 8,000 tickets were snapped up over 24 performances making it easily one of the top-selling shows of the festival. Written and directed by Matthew Hardy, this show is a must for all Breaking Bad fans. And if you still haven’t seen the series yet, what better introduction is there than this whirlwind re-telling of the classic show at St David’s Hall?